With all that has gone on in Flyersland in the last week, don’t think that management hasn’t taken notice of defensive prospect Sam Morin’s postseason run. “Reaching the Memorial Cup is an invaluable and critical part of the growth and knowledge to further enhance Sam’s development,” said GM Ron Hextall. The Rimouski Oceanic begin their final quest for the prestigious Memorial Cup Championship on Saturday, and for Morin, it will happen in front of family and friends in his hometown of Quebec. The road to get to the CHL’s season ending tournament, coincidentally, went through the host city and included a series of tough tests. By the numbers, they had a smooth ride through the QMHL playoffs, reaching the final series by losing just once through three rounds - and Morin hadn’t even been in the lineup for that one loss. The Finals were a different story and a different series. The Oceanic fought from behind the entire series. First, falling into an 0-2 series hole in which they lost the first two games on home ice. After battling back to even the series at 2-2, the Oceanic dropped Game 5 in overtime to face elimination. 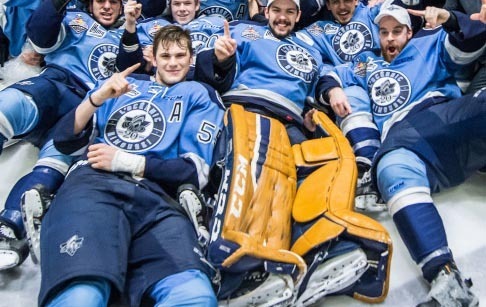 The next two games would also go into overtime, and one goal away from losing the title, Rimouski won Games Six and Seven on back-to-back nights with the final game being decided in a double overtime thriller. “That was really tough because so much energy was spent. In the double the overtime [in Game Six] everyone was tired. We played the night before in overtime and we won, but that was really really tough, but I think we worked hard and won Game Seven. Morin’s tournament officially begins when they take on the OHL Champion, Oshawa Generals, who defeated Connor McDavid and the Erie Otters in the OHL Finals. From there, the round-robin tournament will see the Oceanic play WHL Champion, Kelowna Rockets, on Monday and a rematch of their QMJHL Final series with Quebec on Wednesday before the elimination games begin. One other side note, Flyers prospect Tyrell Goulbourne remains out indefinitely for the Kelowna Rockets. He was injured late in the team’s semifinal series of the Western Hockey League. He is expected to make a full recovery.